There are numerous symptoms associated with traumatic brain injuries. Although research on the topic is improving every day, there are still some mysteries surrounding the injuries. For instance, will a patient ever be symptom-free after their injury? It’s a tough question to answer because the injury varies from person to person. Some traumatic brain injury symptoms are relatively minor and short-lived. Others may be more traumatic and long-lasting. In some cases, symptoms of a TBI do not appear right away. They can take days or weeks after an injury to present themselves. In those cases, people around the affected individual may start to notice subtle signs first. If symptoms do appear immediately (within the first 24 hours), emergency medical assistance is needed. Before we dive into the lifespan of TBI symptoms, let’s explore the most common signs and symptoms associated with traumatic brain injuries. Knowing these signs can help save lives. A complete loss or change in consciousness lasting from a few seconds to a few hours. One dilated pupil or double vision. Fluid draining from the ears or nose. Slurred speech, weakness of arms or legs, loss of balance, etc. After an injury of any degree, headaches, dizziness, confusion, and fatigue are the most common symptoms that appear immediately. These tend to resolve themselves over time, fortunately. You may also experience emotional symptoms, such as frustration and irritability, that develop over time during the recovery period. These symptoms tend to last longer. 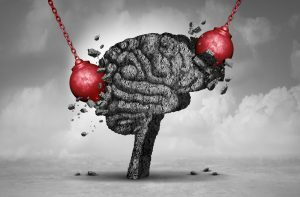 The effects of a moderate to severe TBI can be long-lasting or permanent. It is entirely possible to undergo rehabilitation and recovery after an accident. Still, most severe TBI survivors face permanent challenges that require them to adapt to a new way of living. A moderate to severe TBI can lead to long-lasting physical or mental disabilities. These challenges mean adapting with various work tasks, social obligations, and other routine tasks that were once easy to accomplish. Some patients find their skills and abilities are not as sharp as they once were. Unfortunately, these lifelong challenges can have mental repercussions, too. The individual may feel inadequate or helpless in their current situation. It is common for TBI patients to suffer from depressive and anxiety disorders due to their injuries. These psychological struggles stem from the injury and the stress of facing life-long symptoms. It’s crucial to provide TBI patients with as much love and support as possible. There are resources available online, such as TryMunity, and locally, including support groups and networks, that help patients overcome their challenges. At TryMunity, we have developed a support community for both patients and their loved ones working to overcome traumatic brain injuries and disorders. We have a wealth of knowledge available and a helpful community you can lean on in your time of need.